There are many things to consider when building a website: the message that you want to convey to your various stakeholders and a multitude of design elements, such as, colour, layout, graphics…and the list goes on. However, a website is not a one-way form of communication— from you to the customer. It is a dynamic forum that allows visitors to dialogue with you and your teams of employees through a process of site feedback. A presence on the web ensures potential customers, employees, suppliers and even business partners learn about your business. A website says to potential customers: ‘This is who we are, and what we can do to fulfill your product and service needs, quickly and efficiently!’ To existing customers the website says: ‘Welcome back, what can we do for you today?’ Having a web presence is not enough, to optimize the potential that every website offers, you must make collecting and using site feedback an important part of your business processes. 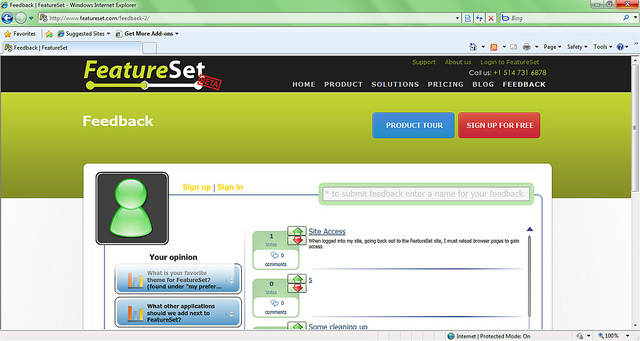 Site feedback is an efficient way of getting free information on what users think of your product and your website. Through site feedback visitors and customers can make suggestions for improvement to your site. For example, users may encounter certain technical or navigational issues that cause frustration. Allowing them to provide site feedback reduces that frustration and gives you the opportunity to take corrective action and improve the visitor’s onsite experience. OneDesk has incorporated a simple feedback tool directly on its website that provides users with a quick and easy way to offer website feedback, such as, bug reports, feature suggestions and usability issues. Check it out here; and give us your feedback…it is always welcome!